If catching “size large” Salmon and Bottom fish appeals to you, look no further than Mike Kelly’s “Tides and Tales” Port Hardy fishing charters, located on beautiful Northern Vancouver Island British Columbia. We have everything it takes to show you the fishing trip of a lifetime on Vancouver Island! With access to some of the richest fishing grounds around Vancouver Island BC, our clients always catch fish on their charter! From the elusive Chinook Salmon that hits like a freight train, to the hard fighting Coho Salmon, we know where the big ones live in the Port Hardy Vancouver Island BC area! If Halibut, lingcod and bottom fish are your passion, we have some of the best charter fishing Vancouver Island BC has to offer! Nature enthusiasts will swoon over our pristine wilderness and wildlife! Whales, dolphins, porpoises, seals, sea lions, sea otter, and bald eagles all call the Port Hardy Vancouver Island BC area home! 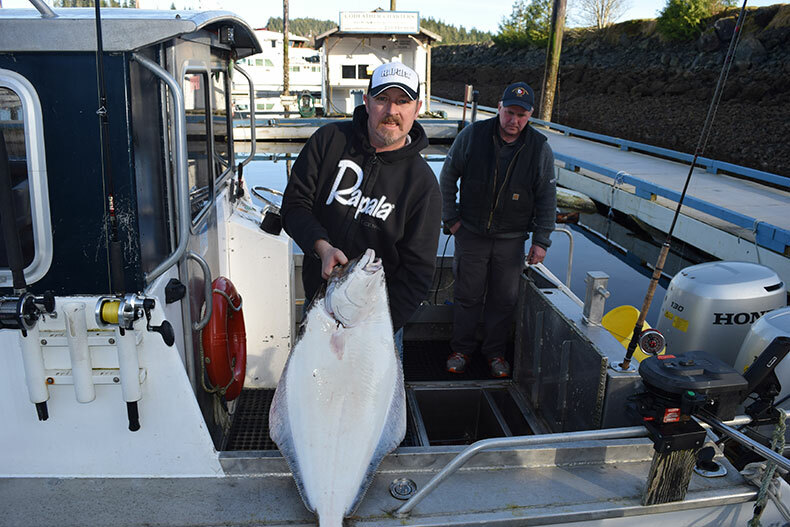 Tides and Tales Fishing Charters from Port Hardy is here for you. “Tides & Tales” professional fishing charters, is in Northern Vancouver Island’s premier choice for sports fishing adventures. We offer the kind of personal attention and service you expect from a world class fishing charter professional. We can assist you in finding local accommodations from inexpensive rooms with kitchen suites to luxury full service hotels. Located in both Port Hardy and Coal Harbor, we have easy access to both the West and East sides of Northern Vancouver Island. Our fishing focus is – Chinook, Coho (also known as the silver Salmon), halibut and bottom fish. There are of course other fish caught with Tides and Tales such as Rockfish, Lingcod and Bottom Fish. We know the cold clean waters of northern Vancouver Island, where the fish are located, and the wonderful time you will have catching them in our wilderness setting. We also offer charters for unforgettable saltwater fly fishing. To experience the best fishing on Vancouver Island, and that your fishing charter experience is the best fishing trip of your lifetime!